CHICAGOPresident Barack Obama accused Senate Republicans on Thursday of jeopardizing the "integrity of the judicial branch" by refusing to considerhis "extraordinary" nominee to the Supreme Court. Holding court before almost 300 Chicago law students, Obama argued that the treatment of judge Merrick Garland will cause the public to lose confidence in the ability of courts at all levels of government to fairly judge cases and resolve controversies. "Our democracy can't afford that," Obama said. Senate Majority Leader Mitch McConnell, R-Ky., had announced hours after Justice Antonin Scalia's death in February that the Senate would not hold hearings or vote on any nomination Obama sent to Capitol Hill in an election year. "We now have a situation where they're saying we simply will not consider the nominee itself. We're just going to shut down the process," Obama said Thursday of Senate Republicans. He said that will lead to potential 4-4 ties from the Supreme Court on cases that remain to be decided and potentially two terms in which the high court will have to manage its workload without a tie-breaking justice. Obama described that as unprecedented. He said the courts have become a troubling extension of the nation's broken political system. 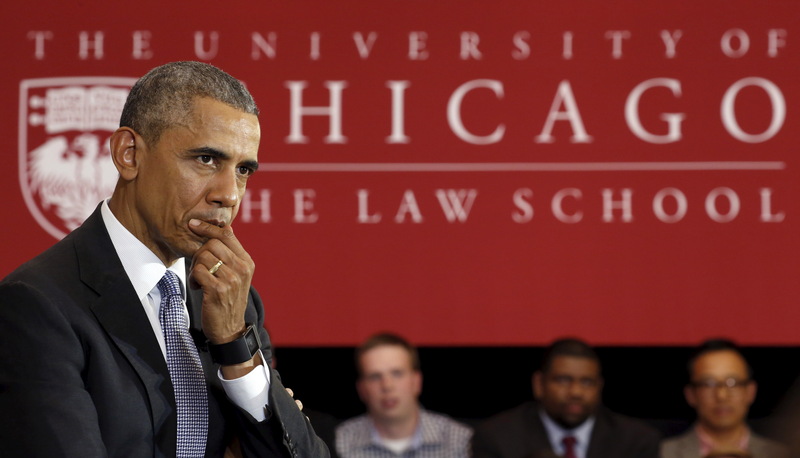 "That erodes the institutional integrity of the judicial branch," Obama told about 300 students, faculty and judges at the University of Chicago Law School, where he taught constitutional law for more than a decade. "At that point, people lose confidence in the ability of the courts to fairly adjudicate cases and controversies and our democracy can't afford that." On the Senate floor Thursday, McConnell said Obama would "be telling supporters a politically convenient fairy tale" if the president argued that the Constitution requires a Senate vote on his nominee. "He will be a unifying force if confirmed," Blumenthal said. Sen. Mark Kirk of Illinois, a Republican regarded as one of the most vulnerable incumbents seeking re-election in November, was the first GOP senator to meet with Garland. Kirk is Garland's home-state senator and one of a few Republicans to call for hearings on his nomination. Kirk on Thursday tweeted a photo of a handwritten note Obama sent thanking the senator for meeting with Garland late last month. Kirk tweeted that he met with the judge "because my responsibility to the people of (hashtag)IL is more important than partisanship." In the note to Kirk, Obama said: "Thank you for your fair and responsible treatment of Merrick Garland. It upholds the institutional values of the Senate, and helps preserve the bipartisan ideals of an independent judiciary." Obama's return to the university marked his first stop there as president. He has often said he misses teaching and being in a classroom. In remarks to a group of students before the event, Obama joked about possibly returning to teach a once-a-week seminar "in which I have no papers to grade."